happy birthday to the late mother teresa – welcome! today, if the great mother teresa lived, she would have been 101 years old… but she died at the age of 87.
this wonderful lady, who was once known as 'the living saint' was born on 26 august 1910 in skopje, macedonia. her birth name was agnes gonxha bojaxhiu. she died on 5 september 1997. in 1979 she was awarded the prestigious nobel peace prize. mother teresa was one of the few persons i admire. i admire her most for her work amongst the poorest of the poor, the homeless, the wretched and unwanted, the dying. yes, the dying. i will never forget and never tired of telling people that she picked up a man from the street who is going to die anytime, cleaned and washed him up and put on a nice clothing for him. then one of her nun said to her, why did she bother when the man is going to die soon. mother teresa said "we have to let him go with dignity." Mother Teresa, whose original name was Agnes Gonxha Bojaxhiu, was born on August 26, 1910 in what is now Skopje, Macedonia. She always wrote her birthday as the 27th of August because that was the day of her baptism, which was always more important to her than her birth. For her work with the poor around the world she received the 1979 Nobel Peace Prize. In 1928 she joined a religious order and took the name Teresa. The order immediately sent her to India. A few years later, she began teaching in Calcutta, and in 1948 the Catholic Church granted her permission to leave her convent and work among the city’s poor people. She became an Indian citizen that same year. 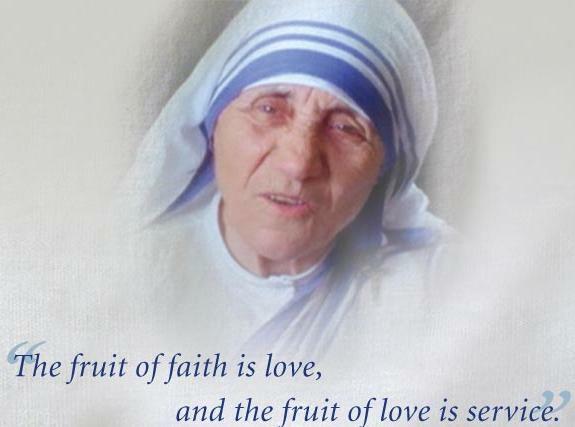 In 1950, she founded a religious order in Calcutta called the Missionaries of Charity. The order provides food for the needy and operates hospitals, schools, orphanages, youth centers, and shelters for lepers and the dying poor. It now has branches in 50 Indian cities and 30 other countries. In addition to the 1979 Nobel Peace Prize, Mother Teresa has received other awards for her work with the needy. These awards include the 1971 Pope John XXIII Peace Prize and India’s Jawaharlal Nehru Award for International Understanding in 1972. Mother Teresa died on September 5, 1997. She is sorely missed. she was beatified by the late blessed pope john paul II on 19 october 2003. now we are eagerly waiting for her to be cannonised, which will earn her to be call a SAINT! referring to my post yesterday, where i talked about the society of st vincent de paul (SSVP), the movement that mother teresa was in, the daughters of charity, is kind of link/related to SSVP. we are doing the same works of helping the poor, needy and marginalised. when googling, i even notice one movement named 'daughters of charity of st vincent de paul'. i'm sure many of you are familiar with the many quotes/sayings of mother teresa. this one here, by mother teresa, is exactly, like what i blog yesterday – that we, in SSVP, see christ in the poor. "At the end of our lives, we will not be judged by how many diplomas we have received, how much money we have made or how many great things we have done. We will be judged by ‘I was hungry and you gave me to eat. I was naked and you clothed me. I was homeless and you took me in." "The greatest disease in the world is not cancer, AIDS, leprosy but it is the feeling of being unwanted." oh yeah, can't end this post without pointing to you the poem that i composed shortly after her death. it was based on the tune of frank sinatra's popular song "my way". here it is… oh and my good facebook friend, al fakhri, had done a video with it. go to facebook and watch and listen! 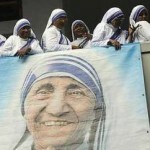 so she said "made them feel loved"
One Response to "happy birthday to the late mother teresa"